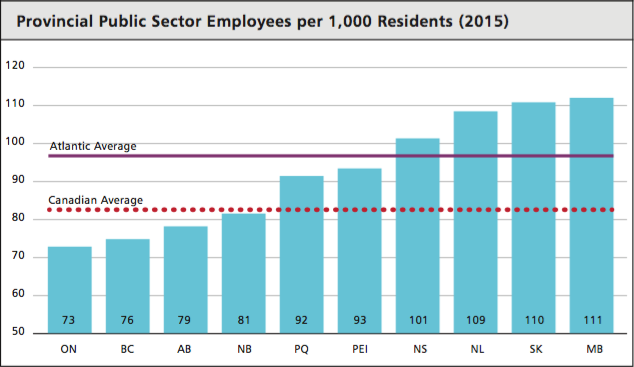 With 81 provincial government employees per 1,000 residents, New Brunswick has a smaller public sector than the Canadian average. By this metric, the province’s public sector is the smallest in Atlantic Canada. 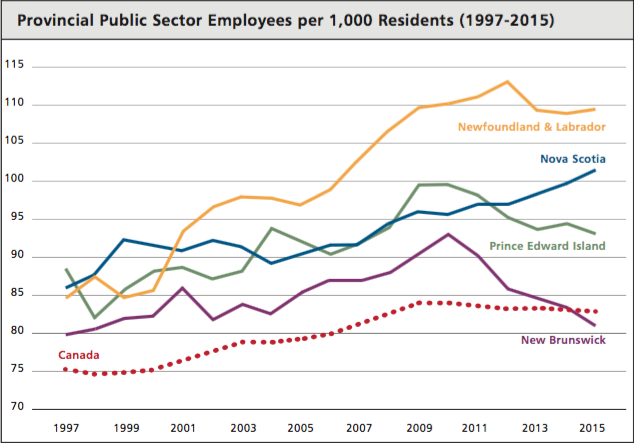 New Brunswick’s public sector grew considerably, from 80 employees per 1,000 residents in 1997 to 93 per 1,000 in 2010. In the past half-decade, however, it has dropped again to 81 per 1,000. P.E.I.’s public sector has also shrunk, if less sharply, since 2010. NL roughly equals its 2010 number today, having peaked in 2012. Nova Scotia’s has grown 5 percent. New Brunswick pays public servants, on average, $76,934 per year – the highest average wage in the region – and employs two fewer persons per 1,000 residents than the average. By employing a below-average number of civil servants in 2015 at this wage, the province saved $101 million.